Forgione Tutoring offers SAT prep and other top-quality test prep services in Raleigh and Cary. We specialize in private (1-on-1) or semi-private (2-on-1) SAT, ACT, and SSAT prep. We have experience working with students of all ability levels, as well as students with learning disabilities, test anxiety, and low academic self-confidence. Although raising students’ test scores is our primary goal, we believe that the boost of confidence, competence, and motivation are important by-products of our work. We have three programs to meet your child’s needs: Comprehensive Program, Subject Area Focus, or a Small Group Class. Comprehensive Program: these are 1-on-1 lessons in which all test subjects are covered each week. This requires 2-2.5 hours/week of tutoring and 12-20 weeks. Sessions can be broken up into two separate lessons or combined into one 2-hr lesson. Comprehensive tutoring should be booked at least 3-4 months in advance of the test date and is subject to availability. Many students stretch the hours throughout a 3 – 9 month period, often taking multiple test administrations. Recommended hours are estimates. We can better quote a recommended number of tutoring hours after analyzing the student’s scores (PSAT, Pre-ACT, PLAN or a diagnostic administered with us) and find out the student’s goal scores. Subject Area Focus: Some students prefer to concentrate on 1 or 2 test subjects at a time to keep the work load and time commitment manageable. The Subject Area Focus is a great option for busy students or for those who prefer to focus only on certain test subjects. Contact us to find out what openings are available at our three Triangle locations. Our tutors are typically available from 3:30 pm – 8:30 pm on weekdays and 9 am – 6 pm on weekends; however during busy seasons availability is often limited and you are encouraged to book early. Sessions are scheduled on the same day, time, and location each week. We do our best to schedule make-up sessions when students need to reschedule. We offer in-house diagnostic testing for students who have not taken a PSAT or Pre-ACT recently. Diagnostic testing is included in the cost of tutoring for in-coming students and $50 per administration for students who are not tutoring with us. 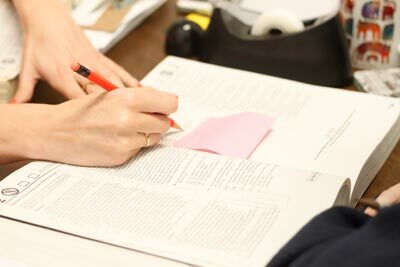 Mock tests are offered on Sunday mornings in our Merton Dr. (Raleigh) and Cary offices, by request. Mock tests are included in the cost of tutoring and are strongly recommended. Our students learn a variety of critical-thinking and active reading strategies to enhance their engagement in the reading process. By using direct instruction, we demonstrate to students how to apply reading strategies, why and when each strategy is useful, and how to modify reading strategies to fit different passage types. Through extensive guided practice and explicit feedback from the tutor, students become more active and strategic readers. We integrate fundamental test-taking and pacing strategies necessary to improving; however, our instruction goes beyond basic test-taking techniques, especially for those who would like significant gains. SAT reading requires an average of 8 hours of strategy lessons, plus 2-4 hours for further practice with timed practice tests. ACT reading can sometimes be accomplished in a minimum of 6 hours, with further pacing practice often needed. Lesson duration is 1-1.5 hours per week. Homework will average 1-1.5 hours per week per subject. Our tutors customize lessons based on the number of hours the student has available and his or her score goals. For students scoring at/over a 600: we can abbreviate and accelerate lessons to target a student’s areas for improvement. Mock tests are included for no additional charge and an unlimited number can be scheduled prior to the real test (mock tests are offered on Sundays only). Our students learn a variety of test-taking strategies that make the math questions less tedious, time-consuming, and intimidating. We aim to uncover and close gaps in a student’s learning through a review of targeted math concepts. Students often need a content review in order to make full use of the strategies. Therefore, we do our best to remediate weaknesses whenever time permits. We also help students better recognize question types and different difficulty levels, so they can pace themselves appropriately. We get to know each student’s strengths so these can be used as an advantage and a source of confidence. As with all our instruction, we bring a “can-do-it” attitude to the math, while making math learning fun and dynamic. The SAT Writing and ACT English are multiple-choice sections, and a student’s performance on these sections factors significantly into the composite score. Because grammar instruction is not consistently taught in schools today, we review the most commonly-tested grammar rules using our in-house “Grammar Guide” as our main resource. For those students already scoring above a 570-600 SAT or 25 ACT, we accelerate the process by determining which specific grammar concepts they need practice with. Semi-private sessions are arranged by families themselves. If your student has friends, siblings, cousins, or classmates he or she would like to tutor with, we will do our best to find a time slot and instructor that accommodates the students’ schedules. Semi-private lessons work best when the students have similar similar needs and goals. There are no contracts or set number of hours required to purchase in advance, but we suggest you follow our recommendations. We accept check, cash, or credit card payments. A 3% convenience fee will be added to credit card payments. Heather first started helping our family when my oldest daughter was preparing to take her SATs, and we immediately loved her. She was so helpful, giving her tips and expanding her knowledge in the subjects related to the ACTs and helped her go up 3 points. She then helped my other daughter, who had taken the SAT previously, but was unhappy with her grade. After just a few months with Heather she raised her score, making her and my other daughter eligible to go to the college of their choice. However, Heather’s involvement with my family did not end there. When my daughter needed help with an essay for a scholarship, Heather immediately offered to help, and constantly e-mailed my daughter back and forth, and even offered to have a phone conversation, despite the fact that there was a six hour time difference. Discovering Heather was the best thing for my daughters, and I have recommended her to many of my friends, who only have wonderful things to say about her.